These jets are powered by the inward accretion of material through the disk coupled with the rotating magnetic field. Outward flowing winds also arise from the inner portions of a disk. It is possible that a wind arising from the very inner edge of the disk (called the x-wind) can entrain small solid particles with it. These objects will be heated strongly as they emerge from the disk’s shadow. Many of these particles will return to the disk several AU from the star, and may drift inward again to repeat the process. Some of these particles may be preserved today in meteorites. Much of the above is based on theory and observations of other stars. To find out how our own solar system formed, it is necessary to study meteorites and interplanetary dust particles (IDPs). These are fragments of rock and metal from other bodies in the solar system that have fallen to Earth and survived passage through its atmosphere. Meteorites and IDPs tend to have broadly similar compositions, and the difference is mainly one of size. IDPs are much the smaller of the two, typically 10–100 μm in diameter, while meteorites can range up to several meters in size. Most such objects are quite unlike any objects formed on Earth. Therefore, we cannot readily link them to natural present-day processes as earth scientists do when unraveling past geological history. Yet the approaches that are used are in some respects very similar. The research conducted on meteorites and IDPs is dominated by two fields: petrography and geochemistry. Petrography is the detailed examination of mineralogical and textural features. Geochemistry uses the isotopic and chemical compositions. Most meteorites are thought to come from parent bodies in the Main Asteroid Belt that formed during the first few million years of the solar system. As a result, these objects carry a record of processes that occurred in the solar nebula during the formation of the planets. In a few cases, the trajectories of falling meteorites have been used to establish that they arrived on orbits coming from the Asteroid Belt. Most other meteorites are deduced to come from asteroids based on their age and composition. IDPs are thought to come from both asteroids and comets. A few meteorites did not originate in the Asteroid Belt. The young ages and noble-gas abundances of the Shergottite–Nakhlite–Chassignite (SNC) meteorites suggest they come from Mars. A few dozen SNC meteorites have been found to date, and a comparable number of lunar meteorites from the Moon are also known. Chondrites are mixtures of grains from submicron sized dust to millimeter- to centimeter-sized particles of rock and metal, apparently assembled in the solar nebula. Most elements in chondrites are present in broadly similar ratios to those in the Sun, with the exception of carbon, nitrogen, hydrogen, and the noble gases, which are all highly depleted. For this reason, chondrites have long been viewed as representative of the dust and debris in the circumstellar disk from which the planets formed. So, for example, refractory elements that would have resided in solid phases in the solar nebula have chondritic (and therefore solar) relative proportions in the Earth, even though the volatile elements are vastly depleted. The non metallic components of chondrites are mostly silicates such as olivine and pyroxene. Chondrules are a major component of most chondrites (see Fig. 6). These are roughly millimeter-sized rounded beads of rock that formed by melting, either partially or completely. Their mineral-grain textures suggest they cooled over a period of a few hours, presumably in the nebula, with the heating possibly caused by passage through shock waves in the nebular gas. Some chondrules are thought to have formed later in collisions between planetary objects. Most chondrites also contain calcium-aluminum-rich inclusions (CAIs, see Fig. 7), which have chemical compositions similar to those predicted for objects that condensed from a gas of roughly solar composition at very high temperatures. It is possible that CAIs formed in the very innermost regions of the solar nebula close to the Sun. Dating based on radioactive isotopes suggest that CAIs are the oldest surviving materials to have formed in the solar system. CAIs in the Efremovka chondrite are 4.5672 ± 0.0006 Ga old based on the 235/238U–207/206Pb system, and this date is often used to define the canonical start to the solar system. The oldest chondrules appear to have formed at about the same time, but most chondrules are 1–3 million years Ma) younger than this (Fig. 8). The space between the chondrules and CAIs in chondrites is filled with fine-grained dust called matrix.Most chondrites are variably depleted in moderately volatile elements like potassium (K) and rubidium (Rb) (Fig. 9). This depletion is more a feature of the chondrules and CAIs rather than the matrix. Chondrites are subdivided into groups of like objects thought to come originally from the same parent body. Currently, about 15 groups are firmly established, 8 of which are collectively referred to as carbonaceous chondrites. These tend to be richer in highly volatile elements such as carbon and nitrogen compared to other chondrites, although as with all meteorites these elements are less abundant than they are in the Sun. Ordinary chondrites are more depleted in volatile elements than carbonaceous chondrites, and are largely made of silicates and metal grains. Enstatite chondrites are similar but highly reduced. Chondrules are absent from the most primitive, volatile-rich group of carbonaceous chondrites (the CI group), either because their parent body formed entirely from matrix-like material or because chondrule structures have been erased by subsequent reactions with water in the parent body. Chondrites also contain presolar grains, which are submicron grains that are highly anomalous isotopically and have compositions that match those predicted to form by condensation in the outer envelopes of various stars. These represent a remarkable source of information on stellar nucleosyntheis and can be used to test theoretical models. Achondrites are silicate-rich mafic and ultramafic igneous rocks not too dissimilar from those forming on Earth but with slightly different chemistry and isotopic compositions. They clearly represent the near-surface rocks of planets and asteroids that have melted and differentiated. A few achondrites come from asteroids that appear to have undergone only partial differentiation. In principle, it is possible to group achondrites and distinguish which planet or asteroid they came from. The oxygen isotopic composition of a meteorite is particularly useful in this respect. Isotopically, oxygen is extremely heterogeneous in the solar system, and planets that formed in different parts of the nebula seem to have specific oxygen isotope compositions. This makes it possible to link all of martian meteorites together for example Fig. 10). These meteorites are specifically linked to Mars because nearly all of them are too young to have formed on any asteroid; they had to come from an object that was large enough to be geologically active in the recent past. This was confirmed by a very close match between the composition of the atmosphere measured with the Viking lander and that measured in fluids trapped in alteration products in martian meteorites. In fact, martian meteorites provide an astonishing archive of information into how Mars formed and evolved as discussed in Section 6. To date, only one asteroidal source has been positively identified: Vesta, whose spectrum and orbital location strongly suggest it is the source of the howardite, eucrite, and diogenite (HED) meteorites. Irons (see Fig. 11) are largely composed of iron, nickel (about 10% by mass), and sulfides, together with other elements that have a chemical affinity for iron, called siderophile elements. Like chondrites, irons can be grouped according to their likely parent body, and several dozen groups or unique irons have been found. The textures of mineral grains in iron meteorites have been used to estimate how quickly their parent bodies cooled, and thus the depth at which they formed. It appears that most irons are samples of metallic cores of small asteroidal parent bodies, 10–100 km in radius. These appear to have formed very early, probably within a million years of CAIs, when there was considerable heat available from decay of short-lived radioactive isotopes (see Section 6). Other irons appear to have formed by impact melting at the surface of asteroids, and these formed later. A rare class of stony-iron meteorite (amounting to about 5% of all nonchondritic meteorites) called pallasites contains an intricate mixture of metal and silicate (Fig. 12). It is thought these come from the core–mantle boundary regions of differentiated asteroids that broke up during collisions. Note that there are no clear examples of mantle material within meteorite collections. The isotopic compositions of some elements in irons reveal that they have been exposed to cosmic rays for long periods—up to hundreds of millions of years. This means their parent bodies broke up a long time ago. Because they are extremely hard, they survived the collisions that destroyed their parent body as well as any subsequent impacts. In contrast, fragments of mantle material (as with samples excavated by volcanoes on the Earth) are extremely friable and would not survive collisions. Survivability is also an issue for meteorites entering Earth’s atmosphere and being recovered in recognizable form. Chondrites and achondrites are mainly composed of silicates that undergo physical and chemical alteration on the surface of Earth more rapidly than the material in iron meteorites. Furthermore, iron meteorites are highly distinctive, so they are easier to recognize than stony meteorites. For this reason, most meteorites found on the ground are irons, whereas most meteorites that are seen to fall from the sky (referred to as falls) are actually chondrites. Most falls are ordinary chondrites, which probably reflects the fact that they survive passage through the atmosphere better than the weaker carbonaceous chondrites. The parent bodies of ordinary chondrites may also have orbits in the Asteroid Belt that favor their delivery to Earth. IDPs are less prone to destruction during passage through the atmosphere than meteorites so they probably provide a less biased sample of the true population of interplanetary material. Most IDPs are compositionally similar to carbonaceous rather than ordinary chondrites and this suggests that the Asteroid Belt is dominated by carbonaceous-chondrite-like material. Mass spectrometric measurements on meteorites and lunar samples provide evidence that the isotopes of most elements are present in similar proportions in the Earth, Moon, Mars, and the asteroids. The isotopes of elements heavier than hydrogen and helium were made by nucleosynthesis in stars that generate extremely varied isotopic compositions. Since the solar nebula probably formed from material from a variety of sources, the observed isotopic homogeneity was originally interpreted as indicative that the inner solar nebula was very hot and planetary material condensed from a ~2000 K gas of solar composition. However, a variety of observations including the preservation of presolar grains in chondrites suggest that the starting point of planet formation was cold dust and gas. This homogeneity is therefore nowadays interpreted as indicating that the inner nebula was initially turbulent, allowing dust to become thoroughly mixed. CAIs sometimes contain nucleosynthetic isotopic anomalies. This suggests that CAIs sampled varied proportions of the isotopes of the elements before they became homogenized in the turbulent disk. With improved mass spectrometric measurements evidence has been accumulating for small differences in isotopic composition in some elements between certain meteorites and those of the Earth and Moon. This area of study that searches for nucleosythetic isotopic heterogeneity in the solar system is ongoing and is now providing a method for tracking the provenance of different portions of the disk. However, oxygen and the noble gases are very different in this respect. Extreme isotopic variations have been found for these elements. The different oxygen and noble gas isotope ratios provide evidence of mixing between compositions of dust and those of volatile (gaseous) components. Some of this mixing may have arisen later when the nebula cooled, possibly because large amounts of isotopically distinct material are thought to have arrived from the outer nebula in the form of water ice. There are also possibilities for generating some of the heterogeneity in oxygen by irradiation within the solar nebula itself. The terrestrial planets and asteroids are not just depleted in nebular gas relative to the Sun. They are also depleted in moderately volatile elements (elements such as lead, potassium, and rubidium that condense at temperatures in the range 700–1350 K) (Figs. 9 and 13). In chondritic meteorites, the degree of depletion becomes larger as an element’s condensation temperature decreases. It was long assumed that this is the result of the loss of gas from a hot nebula before it cooled. For example, by the time temperatures became cool enough for lead to condense, much of the lead had already accreted onto the Sun as a gas. However, it is clear that moderately volatile elements are depleted in chondrites at least in part because they contain CAIs and chondrules that lost volatiles by evaporation during heating events. The least depleted chondrites (CI carbonaceous chondrites) contain no CAIs or chondrules. Another mechanism for losing moderately volatile elements is planetary collisions. Energetic collisions between large bodies would have generated high temperatures and could have caused further loss of moderately volatile elements. For this reason, the terrestrial planets have compositions that differ from one another and also from chondritic meteorites. The Moon is highly depleted in moderately volatile elements (Fig. 9) and is thought to be the product of such an energetic planetary collision. Nucleosynthesis and Short-lived Isotopes With the exception of hydrogen and helium the elements were mainly made by stellar nucleosynthesis. If one examines Fig. 5, seven rather striking features stand out. The estimated abundances of the elements in the Sun and the solar nebula span a huge range of 13 orders of magnitude. For this reason, they are most easily compared by plotting on a log scale such that the number of atoms of Si is 106. Hydrogen and helium are by far the most abundant elements in the Sun as they are elsewhere in the universe. These two elements were made in the Big Bang. The abundances of the heavier elements generally decrease with increasing atomic number. This is because most of the elements are themselves formed from lighter elements by stellar nucleosyntheis. Iron is about 1000 times more abundant than its neighbors in the periodic table because of a peak in the binding energy providing enhanced stability during nucleosynthesis. Lithium, beryllium, and boron are all relatively under abundant compared to other light elements because they are unstable in stellar interiors. A saw-toothed variability is superimposed on the over all trend reflecting the relatively high stability of even numbered isotopes compared to odd-numbered ones. All the elements in the periodic table are present in the solar system except those with no long-lived or stable isotopes, namely technetium (Tc), promethium (Pm), and the trans-uranic elements. in which BSSI is the bulk solar system initial ratio, λ = ln 2/half life is the decay constant (or probability of decay in unit time), and tis the time that elapsed since the start of the solar system. Using this method and the (26Al/27Al)BSSI of ~6 ×10–5 (Table 1), it has been possible to demonstrate that many chondrules formed 1–3 Ma after CAIs. The Sun and the other stars in its cluster inherited a mixture of isotopes from their parent molecular cloud that built up over time from a range of stellar sources. Some short-lived isotopes were probably injected into the Sun’s molecular cloud core or the solar nebula it self from at least one nearby star, possibly a supernova. It is likely that some short-lived isotopes were also generated in the innermost regions of the solar nebula when material was bombarded with energetic particles from the Sun. Determining the origin of a particular isotope and the timing of its production is often difficult. Isotopes with half lives of less than 106 years must have come from a source close to the solar nebula in order to have survived, while isotopes with longer half-lives may have come from further away. Irradiation in the solar nebula could have produced a variety of light isotopes but the relative importance of local production versus external sources is still unclear. Formation in the nebula appears to be the most promising source for 10Be. However, if all of the 26Al had formed this way, it seems likely that some of the other isotopes, especially 41Ca, would have been more abundant than they actually were. In fact, there is mounting evidence that many of the short-lived isotopes were quite uniformly distributed in the solar system, which is hard to explain if they formed in a localized region close to the Sun. Some of the heavier short-lived isotopes that existed in the early solar system (e.g., 107Pd, 129I) can only be produced in large amounts in a massive star. For example, a large flux of neutrons is required to produce 129I, and this is achievable during the enormously energetic death throws of a massive star undergoing a type II supernova explosion. Many of the isotopic ratios in Table 1 are similar, lying in the range 10−6–10−4 for isotopes with half-lives of 0.7 × 106 to 30 × 106 years. This is as expected if all of these isotopes were synthesized in roughly similar proportions just prior to the start of the solar system. Many of these isotopes have initial abundances similar to those that would be formed by an AGB star. However, models for AGB stars do not predict the amounts of 53Mn and 182Hf that once existed. In fact, 182Hf (half-life = 9 × 106 years) requires a large flux of neutrons of the kind produced in the supernova explosion of a much larger star. It is possible that more than one kind of nucleosynthetic process gave rise to the short-lived isotopes in the early solar system. At present, it seems likely that a nearby supernova was involved because the abundance of 60Fe, which has a fairly short half-life, is too high to be explained by alternative sources. Some isotopes that may have been present have yet to be found, including 126Sn and 247Cm with half-lives of 0.3 and 16 Ma. These are both r-process isotopes that should have been present in the early solar system if a supernova occurred nearby. The fact that 247Cm has not been detected places strong constraints on a supernova source. Modeling these processes is complex, but it appears that the supernova explosion of a 25 solar mass star may explain the correct relative abundances of many of the short-lived isotopes, including 182Hf , provided that roughly 5 solar masses of material was left behind in the form of a supernova remnant or a black hole. Supernovas are sufficiently energetic that they could tear apart a molecular cloud core rather than cause it to collapse. Shocks waves with a velocity of at least 20–45 km s−1 are capable of triggering collapse, but if the velocity exceeds ~100 km s–1, a molecular cloud core will be shredded in stead. If the supernova was sufficiently far away, the shock wave would have slowed by the time it reached the molecular cloud core. However, the supernova cannot have been more than a few tens of parsecs away; otherwise, 41Ca (with a half life of only 0.104 × 106 years) would have decayed before it reached the solar nebula. The former presence of 41Ca in CAIs may provide the best constraint on the time between nucleosynthesis of the short-lived isotopes and their incorporation into the solar system. To do this, it will be necessary to ascertain the particular stellar source(s) that gave rise to these isotopes, so that the initial amount of 41Ca can be calculated. Meter-sized particles would have coupled to the largest eddies, with turnover times comparable to the orbital period P. In a strongly turbulent nebula, meter-sized particles would have collided with one another and with smaller particles at high speeds, typically tens of meters per second. Gas pressure in the nebula generally decreased with distance from the Sun. This means gas orbited the Sun more slowly than solid bodies, which moved at the Keplerian velocity. Large solid bodies thus experienced a headwind of up to 100 m/s. The resulting gas drag removed angular momentum from solid bodies, causing them to undergo radial drift toward the Sun. Small particles with ts ~ P drifted slowly at terminal velocity. Very large objects with ts ~ P were only weakly affected by gas drag and also drifted slowly. Drift rates were highest for meter-sized bodies with ts ˜ P (see Fig. 16), and these drifted inward at rates of 1 AU every few hundred years. Rapid inward drift meant that these bodies collided with smaller particles at high speeds. Rapid drift also meant that meter-sized objects had very short life times, and many were probably lost when they reached the hot innermost regions of the nebula and vaporized. The short drift lifetimes and high collision speeds experienced by meter-sized particles have led some researchers to conclude that particle growth stalled at this size because particles were destroyed as fast as they formed. This is often referred to as the meter-sized barrier. This remains an open question however, due to a shortage of experimental data regarding the physics of collisions in a microgravity environment and uncertainty about the level of turbulence in the solar nebula. The presence of nebular gas was not entirely detrimental to growth. Experiments have shown that gas drag can reduce the effect of destructive impacts onto boulder-sized bodies, as collision fragments become entrained in the gas and blown back onto the surface of the larger body. Numerical simulations also show that chondrule-sized particles would be strongly concentrated in stagnant regions in a turbulent nebula, a process called turbulent concentration, thus increasing the chance of further growth. Bodies larger than 1 km generally took a long time to drift inward due to gas drag. These objects were also large enough to have appreciable gravitational fields, making them better able to hold on to fragments generated in collisions. For these reasons, growth became easier once bodies became this large. Much effort has been devoted to seeing whether kilometer-sized bodies could have formed directly, avoiding the difficulties associated with the meter sized barrier. Gravitational instability (GI) offers a possible way to do this. If the level of turbulence in the nebula was very low, solid particles would have settled close to the nebula midplane, increasing their local concentration. Radial drift of particles may also have concentrated particles at a particular location. If enough particles became concentrated in one place, their combined gravitational attraction would render the configuration unstable, allowing the region to become gravitationally bound and collapse. If the particles were then able to contract enough to form a single solid body, the resulting object would be roughly 1–10 km in radius. Such an object is called a planetesimal. Gravitational instability faces severe obstacles however. As solid particles accumulated near the nebula midplane, they would have begun to drag gas around the Sun at Keplerian speeds, while gas above and below the midplane continued to travel at sub-Keplerian speeds. The velocity difference between the layers generated turbulence, puffing up the particle layer until a balance between vertical sedimentation and turbulence was reached. This balance may have prevented particle concentrations from becoming high enough for GI to occur. Calculations suggest that the solid-to-gas ratio in a vertical column of nebula material had to become roughly unity before GI would take place. This means that the concentration of solid material had to become enhanced by 1–2 orders of magnitude compared to the nebula as a whole. If a region of the disk did start to undergo GI, it would only contract to form a planetesimal if the relative velocities of the particles in that region became low enough. Turbulence and radial drift both lead to large relative velocities between particles and may have rendered GI ineffective. The difficulties associated with both the meter-sized barrier and gravitational instability mean that the question of how planetesimals formed remains open for now. However, the fact that roughly half of young stars have debris disks of dust thought to come from asteroids and comets implies that growth of large solid bodies occurs in many protoplanetary disks, even if the mechanism remains obscure. where M and r are the planetesimal’s mass and radius, respectively. When planetesimals pass each other slowly, there is time for their mutual gravitational attraction to focus their trajectories toward each other, so Fg is large, and the chance of a collision is high. Fast moving bodies typically do not collide unless they are traveling directly toward each other because F g ∼= 1 in this case. The relative velocities of plan etesimals depend on their orbits about the Sun. Objects with similar orbits are the most likely to collide with each other. In particular, planetesimals moving on nearly circular, coplanar orbits have high collision probabilities while ones with highly inclined, eccentric (elliptical) orbits do not. Most close encounters between planetesimals did not lead to a collision, but bodies often passed close enough for their mutual gravitational tug to change their orbits. Statistical studies show that after many such close encounters, high-mass bodies tend to acquire circular, coplanar orbits, while low-mass bodies are perturbed onto eccentric, inclined orbits. This is called dynamical friction and is analogous to the equipartition of kinetic energy between molecules in a gas. Dynamical friction means that, on average, the largest bodies in a particular region experience the strongest gravitational focusing; therefore, they grow the fastest (Fig. 17). This state of affairs is called runaway growth for obvious reasons. Most planetesimals remained small, while a few objects, called planetary embryos, grew much larger. Runaway growth continued as long as interactions between planetesimals determined their orbital distribution. However, once embryos became more than about a thousand times more massive than a typical planetesimal, gravitational perturbations from the embryos became more important. The evolution now entered a new phase called oligarchic growth. The relative velocities of planetesimals were determined by a balance between perturbations from nearby embryos and damping due to gas drag. If an embryo were to accrete all of the solid material in its feeding zone it would stop growing when its mass reached a value called the isolation mass, given by Miso ∼ = 8b3π33Msun solid 3 a6 1/2 (11) where  is the surface (column) density of solid material in that region of the disk, and b ≈ 10 is the width of a feeding zone in Hill radii. The surface density in the Sun’s protoplanetary nebula is not known precisely, but for plausible values, the isolation masses would have been about 0.1 Earth masses at 1 AU, and around 10 Earth masses in the outer solar system. Calculations suggest that bodies approached their isolation mass in the inner solar system roughly 105 years after planetesimals first appeared in large numbers. Growth was slower in the outer solar system, but bodies were probably nearing their isolation mass at 5 AU after 106 years. 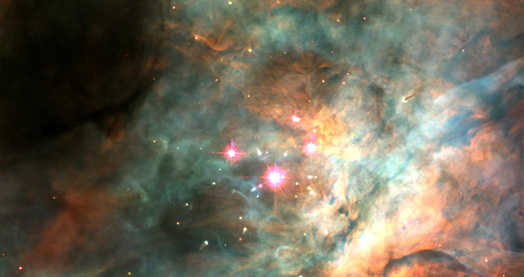 Large embryos significantly perturbed nearby gas in the nebula forming spiral waves. Gas passing through these waves had a higher density than that in the surrounding region. Gravitational interactions between an embryo and its spiral waves transferred angular momentum between them. For conditions likely to exist in the solar nebula, the net result was that each embryo lost angular momentum and migrated inward towards the Sun. This is called type-I migration. Migration rates are proportional to an embryo’s mass M and the local surface density of gas gas: da dt ≈ −4  MMsun  Mgas sun a2 vckep s 2 vkep (12) where cs is the sound speed in the gas and vkep is the orbital velocity of a body moving on a circular, Keplerian orbit. Type-I migration became important after embryos grew to about 0.1 Earth masses. Migration rates can be uncomfortably fast, with a 10-Earth mass body at 5 AU migrating into the Sun in 105 years in a minimum-mass nebula. It is possible that many objects migrated all the way into the Sun and were lost in this way, and the question of how other bodies survived migration is one of the great unresolved questions of planet formation at present. Oligarchic growth in the inner solar system ended when embryos had swept up roughly half of the solid material. However, these embryos were still an order of magnitude less massive than Earth. Further collisions were necessary to form planets the size of Earth and Venus. With the removal of most of the planetesimals, dynamical friction weakened. As a result, interactions between embryos caused their orbits to become more inclined and eccentric. The embryos’ gravitational focusing factors became small, and this greatly reduced the collision rate. As a result, the last stage of planet formation was prolonged, and the Earth may have taken 100 Ma to finish growing. Embryos underwent numerous close encounters with one another before colliding. Each encounter changed an embryo’s orbit, with the result that embryos moved considerable distances radially in the nebula. Numerical cal culations show that the orbital evolution must have been highly chaotic (Fig. 18). As a result, it is impossible to predict the precise characteristics of a planetary system based on observations of typical protoplanetary disks. Other stars with nebulas similar to the Sun may have formed terrestrial planets that are very different from those in the solar system. The radial motions of embryos partially erased any chemical gradients that existed in the nebula during the early stages of planet formation. Mixing cannot have been complete however because Mars and Earth have distinct compositions. Mars is richer in the more volatile rock-forming elements, and the two planets have distinct oxygen isotope mixtures. Unfortunately, we have no confirmed samples of Mercury and Venus, so we know little about their composition. Mercury is known to have an unexpectedly high density, suggesting it has a large iron-rich core and a small mantle. This probably does not reflect compositional differences in the solar nebula because there is no known reason why iron-rich materials would preferentially form closer to the Sun than silicate materials. A more likely explanation is that Mercury suffered a near-catastrophic impact after it had differentiated, and this stripped away much of the silicate mantle. Mercury’s location close to the Sun made it especially vulnerable in this respect because orbital velocities and hence impact speeds are highest close to the Sun. Earth and Venus are probably composites of ten or more embryos so their chemical and isotopic compositions represent averages over a fairly large region of the inner solar system. Mars and Mercury are sufficiently small that they may be individual embryos that did not grow much beyond the oligarchic growth stage. It is currently a mystery why Earth and Venus continued to grow while Mars did not. It may be that Mars formed in a low-density region of the nebula or that all other embryos were removed from that region without colliding with Mars. As embryos grew larger, their temperatures increased due to kinetic energy released during impacts and the decay of radioactive isotopes in their interiors. Short-lived isotopes such as 26Al and 60Fe, with half-lives of 0.7 × 106 and 1.5 × 106 years, respectively (Table 1), were particularly powerful heat sources early in the solar system. Bodies more than a few kilometers in radius would have melted if they had formed within the first 2 Ma when the short-lived isotopes were still abundant. Embryos that melted also differentiated, with iron and siderophile elements sinking to the center to form a core, while lighter silicates formed a mantle closer to the surface. The abundances of the highly siderophile elements in Earth’s mantle are higher than one would expect to find after the planet differentiated because most siderophile material should have been extracted into the core. The most likely explanation for these high abundances is that Earth continued to acquire some material after its core and mantle had finished separating. This late veneer amounted to about 1% of the total mass of the planet. The origin of Earth’s water is the subject of much debate at present. Earth’s oceans contain about 0.03% of the planet’s total mass. A roughly comparable amount of water exists in the mantle (with an uncertainty of a factor of 3 in either direction). Earth may have also lost an unknown fraction of its water early in its history due to reactions with iron. where tCHUR is the time of separation from a CHondritic Uniform Reservoir, λ = (ln 2/half-life) is the decay constant for 182Hf (0.078 per million years) and (182Hf/180Hf)BSSI is the bulk solar system initial ratio of 182Hf to 180Hf. Tungsten-182 excesses have been found in Earth, Mars, and the HED meteorites, which are thought to come from asteroid Vesta, indicating that all these bodies differentiated while some 182Hf was still present. Iron meteorites, which come from the cores of differentiated planetesimals, have low Hf/W ratios and are deficient in 182W. This means these planetesimals must have formed at a very early stage before most of the 182Hf had decayed. New, very precise 182Hf–182W chronometry has shown that some of these objects formed within the first few hundred thousand years of the solar system (Fig. 8). New modeling of the latest 182Hf–182W data for martian meteorites also provides evidence that Mars grew and started differentiating within about 1 Ma of the start of the solar system. This short timescale is consistent with runaway growth described earlier. So far, isotopic data for other silicate objects has not been so readily explicable in terms of very rapid growth. However, asteroid Vesta certainly formed within about 3 Ma of the start of the solar system (Fig. 8). The existence of meteorites from differentiated asteroids suggests that core formation began early, and this is confirmed by 182Hf–182W chronometry. Therefore, most planetary embryos would have been differentiated when they collided with one another. Although Mars grew extremely rapidly, Earth does not appear to have reached its current size until the giant impact that was associated with the formation of the Moon (see Section 8). 182Hf–182W chronometry for lunar samples shows that this took place 35–50 Ma after the start of the solar system. Geochemical evidence has been used to argue that the formation of the Moon probably happened near the end of Earth’s accretion, and this is consistent with the results of Moon-forming impact simulations. This is also consistent with the W isotopic composition of the silicate Earth itself (Fig. 20). This shows that the Earth accreted at least half of its mass within the first 3 × 107 years of the solar system. However, the data are fully consistent with the final stage of accretion being around the time of the Moon-forming impact. Because the Earth accreted over a protracted period rather than in a single event, it is simplest to model the W isotope data in terms of an exponentially decreasing rate of growth (Fig. 20). F = 1 − e−(1/τ)×t (14) where F is the mass fraction of the Earth that has accumulated, τ is the mean life for accretion in millions of years (Fig. 20) and t is time in millions of years. This is consistent with the kinds of curves produced by the late George Wetherill who modeled the growth of the terrestrial planets using Monte Carlo simulations. The W isotope data are consistent with a mean life of between 10 and 15 Ma, depending on the exact parameters used. This is fully consistent with the timescales proposed by Wether ill. From these protracted timescales, it is clear that Earth took much longer to approach its current size than Mars or Vesta, which probably formed from different mechanisms (Fig. 8). Jupiter and Saturn are mostly composed of hydrogen and helium. These elements do not condense at temperatures and pressures found in protoplanetary disks, so they must have been gravitationally captured from the gaseous component of the solar nebula. Observations of young stars indicate that protoplanetary disks survive for only a few million years, and this sets an upper limit for the amount of time required to form giant planets. Uranus and Neptune also contain significant amounts of hydrogen and helium (somewhere in the range 3–25%), and so they probably also formed quickly, before the solar nebula dispersed. Jupiter and Saturn also contain elements heavier than helium and they are enriched in these elements compared to the Sun. The gravitational field of Saturn strongly suggests it has a core of dense material at its center, containing roughly one fifth of the planet’s total mass. Jupiter may also have a dense core containing a few Earth masses of material. The interior structure of Jupiter remains quite uncertain because we lack adequate equations of state for the behavior of hydrogen at the very high pressures found in the planet’s interior. The upper atmospheres of both planets are enriched in elements such as carbon, nitrogen, sulfur, and argon, compared to the Sun. It is thought likely that these enrichments extend deep into the planets’ interiors, but this remains uncertain. Giant planets may form directly by the contraction and collapse of gravitationally unstable regions of a protoplanetary disk. This disk instability is analogous to the gravitational instabilities that may have formed planetesimals, but instead the instability takes place in nebula gas rather than the solid component of the disk. Instabilities will occur if the Toomre stability criterion Q becomes close to or lower than 1, where Q = Msuncs πa2vkep (15) where vkep is the Keplerian velocity, cs is the sound speed, and  is the local surface density of gas in the disk. Gas in an unstable region quickly becomes much denser than the surrounding material. Disk instability requires high surface densities and low sound speeds (cold gas), so it is most likely to occur in the outer regions of a massive protoplanetary disk. Numerical calculations suggest instabilities will occur beyond about 5 AU in a nebula a few times more massive than the minimum-mass solar nebula. What happens to an unstable region depends on how quickly the gas cools as it contracts, and this is the subject of much debate. If the gas remains hot, the dense regions will quickly become sheared out and destroyed by the differential rotation of the disk. If cooling is efficient, simulations show that gravitationally bound clumps will form in a few hundred years, and these may ultimately contract to form giant planets. Initially, such planets would be homogeneous and have the same composition as the nebula. Their structure and composition may change subsequently due to gravitational settling of heavier elements to the center and capture of rocky or icy bodies such as comets. The evidence for dense cores at the centers of Jupiter and Saturn suggests to many scientists that giant planets form by core accretion rather than disk instability. In this model, the early stages of giant-planet formation mirror the growth of rocky planets, beginning with the formation of planetesimals, followed by runaway and oligarchic growth. However, planetary embryos would have grown larger in the outer solar system for two reasons. First, feeding zones here are larger because the Sun’s gravity is weaker, so each embryo gravitationally holds sway over a larger region of the nebula. Second, temperatures here were cold enough for volatile materials such as tars, water ice, and other ices to condense, so more solid material was available to build large embryos. In the outer solar system, bodies roughly ten times more massive than Earth would have formed via oligarchic growth in a million years, provided the disk was a few times more massive than the minimum-mass solar nebula. Bodies that grew larger than Mars would have captured substantial atmospheres of gas from the nebula. Such atmospheres remain in equilibrium due to a balance between an embryo’s gravity and an outward pressure gradient. However, there is a critical core mass above which an embryo can no longer support a static atmosphere. Above this limit, the atmosphere begins to collapse onto the planet forming a massive gas envelope that increases in mass over time as more gas is captured from the nebula. As gas falls toward the planet, it heats up as gravitational potential energy is released. The rate at which a planet grows depends on how fast this heat can be radiated away. The critical core mass depends on the opacity of the envelope and the rate at which planetesimals collide with the core, but calculations suggest it is in the range 3–20 Earth masses. The growth of the envelope is slow at first, but speeds up rapidly once an embryo reaches 20–30 Earth masses. Numerical simulations show that Jupiter-mass planets can form this way in 1–5 Ma. Such planets are mostly composed of hydrogen-rich nebular gas, but are also enriched in heavier elements due to the presence of a solid core. As with the disk instability, the planet’s envelope may be further enriched in heavy elements by collisions with comets. Measurements by the Galileo spacecraft showed that Jupiter’s upper atmosphere is enriched in carbon, nitrogen, sulfur, and the noble gases argon, krypton, and xenon by factors of 2–3 compared to the Sun. If these enrichments are typical of Jupiter’s envelope as a whole, it suggests the planet captured a huge number of comets. Argon can be trapped in cometary ices but only if these ices form at temperatures below about 30 K. Temperatures at Jupiter’s current distance from the Sun were probably quite a lot higher than this. This suggests either that the comets came from colder regions of the nebula or that Jupiter itself migrated inward over a large distance. However, the fact that relatively refractory elements such as sulfur are present in the same enrichment as the noble gases suggests these elements may all have been captured as gases from the nebula along with hydrogen and helium. If so, Jupiter’s envelope must be non homogeneous, with the lower layers depleted in heavy elements, perhaps due to exclusion from high pressure phases of hydrogen, while the upper layers are enriched. It is unclear why Jupiter and Saturn stopped growing when they reached their current masses. These planets are sufficiently massive that they would continue to grow very rapidly if a supply of gas was available nearby. It is possible, but unlikely, that they stopped growing because the nebula happened to disperse at this point. A more likely explanation is that the growth of these planets slowed because they each became massive enough to clear an annular gap in the nebula around their orbit. Gap clearing happens when a planet’s Hill radius becomes comparable to the vertical thickness of the gas disk, which would have been the case for Jupiter and Saturn. Gas orbiting a little further from the Sun than Jupiter would have been sped up by the planet’s gravitational pull, moving the gas away from the Sun. Gas orbiting closer to the Sun than Jupiter was slowed down, causing it to move inward. These forces open up a gap in the disk around Jupiter’s orbit, balancing viscous forces that would cause gas to flow back into the gap. Numerical simulations show that generally gaps are not cleared completely, and some gas continues to cross a gap and accrete onto a planet. However, the accretion rate declines as a planet becomes more massive. Uranus and Neptune are referred to as ice giant planets because they contain large amounts of materials such as water and methane that form ices at low temperatures. They contain some hydrogen and helium, but they did not acquire the huge gaseous envelopes that Jupiter and Saturn possess. This suggests the nebula gas had largely dispersed in the region where Uranus and Neptune were forming before they became massive enough to undergo rapid gas accretion. This may be because they formed in the outer regions of the protoplanetary disk, where embryo growth rates were slowest. It is also possible that the nebula dispersed more quickly in some regions than others. In particular, the outer regions of the nebula may have disappeared at an early stage as the gas escaped the solar system due to photoevaporation by ultraviolet radiation. The presence of a gap modifies planetary migration. Planets massive enough to open a gap still generate spiral density waves in the gas beyond the gap, but these waves are located further away from the planet as a result, so migration is slower. As a planet with a gap migrates inward, gas tends to pile up at the inner edge of the gap and become rarified at the outer edge, slowing migration as a result. The migration of the planet now becomes tied to the inward viscous accretion of the gas toward the star. The planet, its gap, and the nebular gas all move inward at the same rate, given by da dt = −1.5α vckep s 2 vkep (16) where α = νvkep/(acs2) and ν is the viscosity of the nebular gas. This is called type-II migration. Type-II migration slows when a planet’s mass becomes comparable to that of the nebula, and migration ceases as the nebular gas disperses. Giant planets in the solar system experienced another kind of migration as they interacted gravitationally with planetesimals moving on orbits between the giant planets and in the primordial Kuiper Belt. One consequence of this process was the formation of the Oort cloud of comets. Once Jupiter approached its current mass, many planetesimals that came close to the planet would have been flung far beyond the outer edge of the protoplanetary disk. Some were ejected from the solar system altogether, but others remained weakly bound to the Sun. Over time, gravitational interactions with molecular clouds, other nearby stars, and the galactic disk circularized the orbits of these objects so they no longer passed through the planetary system. Many of these objects are still present orbiting far from the Sun in the Oort cloud. The ultimate source of angular momentum for these objects came at the expense of Jupiter’s orbit, which shrank accordingly. Saturn, Uranus, and Neptune ejected some planetesimals, but they also perturbed inward many objects, which were then ejected by Jupiter. As a result, Saturn, Uranus, and Neptune probably moved outward rather than inward. As Neptune migrated outward, it interacted dynamically with the primordial Kuiper Belt of comets orbiting in the very outer region of the nebula. Some of these comets were ejected from the solar system or perturbed inward toward Jupiter. Others were perturbed onto highly eccentric orbits with periods of hundreds or thousands of years, and now form the scattered disk,a region that extends out beyond the Kuiper Belt but whose objects are gradually being removed by close encounters with Neptune. A sizable fraction of the objects in the region beyond Neptune were trapped in external mean-motion resonances and migrated outward with the planet. Pluto, currently located in the 3:2 mean motion resonance with Neptune, probably represents one of these objects. As the giant planets migrated, it is possible that they passed through orbital resonances with one another. In particular, if Jupiter and Saturn passed through the 2:1 mean-motion resonance, their orbital eccentricities would have increased significantly, with important consequences throughout the solar system. The eccentricities of Uranus and Neptune would have briefly become large until they were damped by dynamical friction with the primordial Kuiper Belt. Many comets would have been perturbed into the inner solar system as a result. In addition, the changing orbits of the giant planets would have perturbed many main belt asteroids into unstable resonances, also leading to a flux of asteroids into orbits crossing the inner planets. Currently, it is unclear whether Jupiter and Saturn passed through the 2:1 resonance, or when this may have happened. It has been proposed that passage through this resonance was responsible for the late heavy bombardment of the inner planets, which occurred 600–700 Ma after the start of the solar system and left a clear record of impacts on the Moon, Mars, and Mercury. The Asteroid Belt currently contains only enough material to make a planet 2000 times less massive than Earth, even though the spatial extent of the belt is huge. It seems likely that this region once contained much more mass than it does today. A smooth interpolation of the amount of solid material needed to form the inner planets and the gas giants would place about 2 Earth-masses in the Asteroid Belt. Even if most of this mass was lost at an early stage, the surface density of solid material must have been at least 100 times higher than it is today in order to grow bodies the size of Ceres and Vesta (roughly 900 and 500 km in diameter, respectively) in only a few million years. Several regions of the Asteroid Belt contain clusters of asteroids with similar orbits and similar spectral features, suggesting they are made of the same material. These clusters are fragments from the collisional breakup of larger asteroids. There are relatively few of these asteroid families, which implies that catastrophic collisions are quite rare. This suggests the Asteroid Belt has contained relatively little mass for most of its history. The spectrum of asteroid Vesta, located 2.4 AU from the Sun, shows that it has a basaltic crust. The HED meteorites, which probably come from Vesta, show this crust formed only a few million years after the solar system, according to several isotopic systems. The survival of Vesta’s crust suggests that the crust formed the impact rate in the belt has never been much higher than it is today. For these reasons, it is thought that most of the Asteroid Belt’s original mass was removed at a very early stage by a dynamical process rather than by collisional erosion. The Asteroid Belt currently contains a number of orbital resonances associated with the giant planets. Resonances occur when either the orbital period or precession period of an asteroid has a simple ratio with the corresponding period for one of the planets. Many resonances induce large changes in orbital eccentricity, causing asteroids to fall into the Sun, or to come close to Jupiter, leading to close encounters and ejection from the solar system. For this reason, there are very few asteroids that orbit the Sun twice every time Jupiter orbits the Sun once, for example. When the nebular gas was still present, small asteroids moving on eccentric orbits would have drifted inward rapidly due to gas drag. After the giant planets had formed, a combination of resonances and gas drag may have transferred most objects smaller than a few hundred kilometers from the Asteroid Belt into the terrestrial-planet region. Larger planetary embryos would not have drifted very far. However, once oligarchic growth ceased, embryos began to gravitationally scatter one another across the belt. Numerical simulations show that most or all of these bodies would eventually enter a resonance and be removed, leaving an Asteroid Belt greatly depleted in mass and containing no objects bigger than Ceres. The timescale for the depletion of the belt depends sensitively on the orbital eccentricities of the giant planets at the time, which are poorly known. The belt may have been cleared in only a few million years, but it may have required as much as several hundred million years if the giant planets had nearly circular orbits. The albedos and spectral features of asteroids vary widely from one body to another, but clear trends are apparent as one moves across the Asteroid Belt. S-type asteroids, which generally lie in the inner Asteroid Belt, appear to be more thermally processed than the C-type asteroids that dominate the middle belt. These may include the parent bodies of ordinary and carbonaceous chondrites respectively. C-types in turn seem more processed than the P-type asteroids that mostly lie in the outer belt. These differences may reflect differences in the composition of solid materials in different parts of the nebula, or differences in the time at which asteroids formed. Ordinary and enstatite chondrites, which probably come from the inner Asteroid Belt, tend to be dry, while carbonaceous chondrites from the middle and outer belt contain up to 10% water by mass in the form of hydrated minerals. This suggests that temperatures were cold enough in the outer Asteroid Belt for water ice to form and become incorporated into asteroids where it reacted with dry rock. Temperatures were apparently too high for water ice to condense in the inner Asteroid Belt. It is possible that some of the objects currently in the Asteroid Belt formed elsewhere. For example, it has been proposed that many of the parent bodies of the iron meteorites, and possibly Vesta, formed in the terrestrial-planet region and were later gravitationally scattered outward to their current orbits. Iron meteorites from the cores of melted asteroids are common, whereas meteorites from the mantles of these asteroids are rarely seen. This suggests that a substantial amount of collisional erosion took place at an early stage, with only the strong, iron-rich cores of many bodies surviving. A number of other meteorites also show signs that their parent asteroids experienced violent collisions early in their history. Chondrites presumably formed somewhat later than the differentiated asteroids, when the main radioactive heat sources had mostly decayed. Chondrites are mostly composed of chondrules, which typically formed 1–3 Ma after CAIs. Chondrite parent bodies cannot be older than the youngest chondrules they contain, so they must have formed several million years after the start of the solar system. For this reason, it appears that the early stages of planet formation were prolonged in the Asteroid Belt. Chondrites have experienced some degree of thermal processing, but their late formation meant that their parent bodies never grew hot enough to melt, which has allowed chondrules, CAIs, and matrix grains to survive. Jupiter and Saturn are mostly composed of hydrogen and helium. These elements do not condense at temperatures and pressures found in protoplanetary disks, so they must have been gravitationally captured from the gaseous component of the solar nebula. Observations of young stars indicate that protoplanetary disks survive for only a few million years, and this sets an upper limit for the amount of time required to form giant planets. Uranus and Neptune also contain significant amounts of hydrogen and helium (somewhere in the range 3–25%), and so they probably also formed quickly, before the solar nebula dispersed. Jupiter and Saturn also contain elements heavier than helium and they are enriched in these elements compared to the Sun. The gravitational field of Saturn strongly suggests it has a core of dense material at its center, containing roughly one fifth of the planet’s total mass. Jupiter may also have a dense core containing a few Earth masses of material. The interior structure of Jupiter remains quite uncertain because we lack adequate equations of state for the behavior of hydrogen at the very high pressures found in the planet’s interior. The upper atmospheres of both planets are enriched in elements such as carbon, nitrogen, sulfur, and argon, compared to the Sun. It is thought likely that these enrichments extend deep into the planets’ interiors, but this remains uncertain. Giant planets may form directly by the contraction and collapse of gravitationally unstable regions of a protoplanetary disk. This disk instability is analogous to the gravitational instabilities that may have formed planetesimals, but instead the instability takes place in nebula gas rather than the solid component of the disk. Instabilities will occur if the Toomre stability criterion Q becomes close to or lower than 1, where Q = Msuncs πa2vkep (15) where vkep is the Keplerian velocity, cs is the sound speed, and  is the local surface density of gas in the disk. Gas in an unstable region quickly becomes much denser than the surrounding material. Disk instability requires high surface densities and low sound speeds (cold gas), so it is most likely to occur in the outer regions of a massive protoplanetary disk. Numerical calculations suggest instabilities will occur beyond about 5 AU in a nebula a few times more massive than the minimum-mass solar nebula. What happens to anunstable region depends on how quickly the gas cools as it contracts, and this is the subject of much debate. If the gas remains hot, the dense regions will quickly become sheared out and destroyed by the differential rotation of the disk. If cooling is efficient, simulations show that gravitationally bound clumps will form in a few hundred years, and these may ultimately contract to form giant planets. Initially, such planets would be homogeneous and have the same composition as the nebula. Their structure and composition may change subsequently due to gravitational settling of heavier elements to the center and capture of rocky or icy bodies such as comets. The evidence for dense cores at the centers of Jupiter and Saturn suggests to many scientists that giant planets form by core accretion rather than disk instability. In this model, the early stages of giant-planet formation mirror the growth of rocky planets, beginning with the formation of planetesimals, followed by runaway and oligarchic growth. However, planetary embryos would have grown larger in the outer solar system for two reasons. First, feeding zones here are larger because the Sun’s gravity is weaker, so each embryo gravitationally holds sway over a larger region of the nebula. Second, temperatures here were cold enough for volatile materials such as tars, water ice, and other ices to condense, so more solid material was available to build large embryos. In the outer solar system, bodies roughly ten times more massive than Earth would have formed via oligarchic growth in a million years, provided the disk was a few times more massive than the minimum-mass solar nebula. Bodies that grew larger than Mars would have captured substantial atmospheres of gas from the nebula. Such atmospheres remain in equilibrium due to a balance between an embryo’s gravity and an outward pressure gradient. However, there is a critical core mass above which an embryo can no longer support a static atmosphere. Above this limit, the atmosphere begins to collapse onto the planet forming a massive gas envelope that increases in mass over time as more gas is captured from the nebula. As gas falls toward the planet, it heats up as gravitational potential energy is released. The rate at which a planet grows depends on how fast this heat can be radiated away. The critical core mass depends on the opacity of the envelope and the rate at which planetesimals collide with the core, but calculations suggest it is in the range 3–20 Earth masses. The growth of the envelope is slow at first, but speeds up rapidly once an embryo reaches 20–30 Earth masses. Numerical simulations show that Jupiter-mass planets can form this way in 1–5 Ma. Such planets are mostly composed of hydrogen-rich nebular gas, but are also enriched in heavier elements due to the presence of a solid core. As with the disk instability, the planet’s envelope may be further enriched in heavy elements by collisions with comets. Measurements by the Galileo spacecraft showed that Jupiter’s upper atmosphere is enriched in carbon, nitrogen, sulfur, and the noble gases argon, krypton, and xenon by factors of 2–3 compared to the Sun. If these enrichments are typical of Jupiter’s envelope as a whole, it suggests the planet captured a huge number of comets. Argon can be trapped in cometary ices but only if these ices form at temperatures below about 30 K. Temperatures at Jupiter’s current distance from the Sun were probably quite a lot higher than this. This suggests either that the comets came from colder regions of the nebula or that Jupiter itself migrated inward over a large distance. However, the fact that relatively refractory elements such as sulfur are present in the same enrichment as the noble gases suggests these elements may all have been captured as gases from the nebula along with hydrogen and helium. If so, Jupiter’s envelope must be non homogeneous, with the lower layers depleted in heavy elements, perhaps due to exclusion from high pressure phases of hydrogen, while the upper layers are enriched. It is unclear why Jupiter and Saturn stopped growing when they reached their current masses. These planets are sufficiently massive that they would continue to grow very rapidly if a supply of gas was available nearby. It is possible, but unlikely, that they stopped growing because the nebula happened to disperse at this point. A more likely explanation is that the growth of these planets slowed because they each became massive enough to clear an annular gap in the nebula around their orbit. Gap clearing happens when a planet’s Hill radius becomes comparable to the vertical thickness of the gas disk, which would have been the case for Jupiter and Saturn. Gas orbiting a little further from the Sun than Jupiter would have been sped up by the planet’s gravitational pull, moving the gas away from the Sun. Gas orbiting closer to the Sun than Jupiter was slowed down, causing it to move inward. These forces open up a gap in the disk around Jupiter’s orbit, balancing viscous forces that would cause gas to flow back into the gap. Numerical simulations show that generally gaps are not cleared completely, and some gas continues to cross a gap and accrete onto a planet. However, the accretion rate declines as a planet becomes more massive. where α = νvkep/(acs2) and ν is the viscosity of the nebular gas. This is called type-II migration. Type-II migration slows when a planet’s mass becomes comparable to that of the nebula, and migration ceases as the nebular gas disperses. Giant planets in the solar system experienced another kind of migration as they interacted gravitationally with planetesimals moving on orbits between the giant planets and in the primordial Kuiper Belt. One consequence of this process was the formation of the Oort cloud of comets. Once Jupiter approached its current mass, many planetesimals that came close to the planet would have been flung far beyond the outer edge of the protoplanetary disk. Some were ejected from the solar system altogether, but others remained weakly bound to the Sun. Over time, gravitational interactions with molecular clouds, other nearby stars, and the galactic disk circularized the orbits of these objects so they no longer passed through the planetary system. Many of these objects are still present orbiting far from the Sun in the Oort cloud. The ultimate source of angular momentum for these objects came at the expense of Jupiter’s orbit, which shrank accordingly. Saturn, Uranus, and Neptune ejected some planetesimals, but they also perturbed inward many objects, which were then ejected by Jupiter. As a result, Saturn, Uranus, and Neptune probably moved outward rather than inward. As Neptune migrated outward, it interacted dynamically with the primordial Kuiper Belt of comets orbiting in the very outer region of the nebula. Some of these comets were ejected from the solar system or perturbed inward toward Jupiter. Others were perturbed onto highly eccentric orbits with periods of hundreds or thousands of years, and now form the scattered disk,a region that extends out beyond the Kuiper Belt but whose objects are gradually being removed by close encounters with Neptune. A sizable fraction of the objects in the region beyond Neptune were trapped in external mean-motion resonances and migrated outward with the planet. Pluto, currently located in the 3:2 mean motion resonance with Neptune, probably represents one of these objects. As the giant planets migrated, it is possible that they passed through orbital resonances with one another. In particular, if Jupiter and Saturn passed through the 2:1 mean-motion resonance, their orbital eccentricities would have increased significantly, with important consequences throughout the solar system. The eccentricities of Uranus and Neptune would have briefly become large until they were damped by dynamical friction with the primordial Kuiper Belt. Many comets would have been perturbed into the inner solar system as a result. In addition, the changing orbits of the giant planets would have perturbed many main belt asteroids into unstable resonances, also leading to a flux of asteroids into orbits crossing the inner planets. Currently, it is unclear whether Jupiter and Saturn passed through the 2:1 resonance, or when this may have happened. It has been proposed that passage through this resonance was responsible for the late heavy bombardment of the inner planets, which occurred 600–700 Ma after the start of the solar system and left a clear record of impacts on the Moon, Mars, and Mercury. Earth’s moon possesses a number of unusual features. It has a low density compared to the inner planets, and it has only a very small core. The Moon is highly depleted in volatile materials such as water. In addition, the Earth– Moon system has a large amount of angular momentum per unit mass. If they were combined into a single body, the object would rotate once every 4 hours! All these features can be understood if the Moon formed as the result of an oblique impact between Earth and another large, differentiated body, sometimes referred to as Theia, late in Earth’s formation. Numerical simulations of this giant impact show that much of Theia’s core would have sunk through Earth’s mantle to coalesce with Earth’s core. Molten and vaporized mantle material from both bodies was ejected outward. Gravitational torques from the highly nonspherical distribution of matter during the collision gave some of this mantle material enough angular momentum to go into orbit about Earth. the Moon is mostly composed of material from Earth rather than Theia, although numerical simulations tend to find that the opposite is true in this case. The impact released huge amounts of energy, heating the disk sufficiently that many volatile materials escaped. As a result, the Moon formed mostly from volatile-depleted mantle materials, explaining its current composition. The simulations suggest Theia probably had a mass similar to Mars, which has roughly one tenth the mass of Earth. We know little about Theia’s composition except that, like Mars, it seems to have been rich in geochemical volatile elements such as rubidium compared to Earth (Fig. 9). The Earth and the Moon have identical oxygen isotope characteristics (Fig. 10). It was once thought that this meant Earth and Theia had a similar isotopic composition, but this similarity now appears to be the result of exchange of material be tween the Earth and the protolunar disk while the Moon was forming. The satellites of the giant planets are much smaller relative to their parent planet than the Moon is compared to the Earth. Whereas the Moon is roughly 1/80 of the mass of the Earth, the satellite systems of Jupiter, Saturn, and Uranus each contain about 1/10,000 of the mass of their respective planet. The satellites of the giant planets can be divided into two classes with different properties. Those close to their parent planet tend to have nearly circular orbits in the same plane as the planet’s equator and orbiting in the same direction as the planet spins. These are referred to as regular satellites. Satellites orbiting further from the planettend to have highly inclined and eccentric orbits, and these are called irregular satellites as a result. The regular satellites tend to be larger and include the Galilean satellites of Jupiter and Saturn’s largest satellite Titan. The orbits of the regular satellites suggest they formed from gas-rich circumplanetary disks orbiting each planet, while the irregular satellites are thought to have been captured later. Large satellites would have moved rapidly inward through a circumplanetary disk due to type-I migration, on a timescale that was short compared to the lifetime of the solar nebula. For this reason, it is likely that multiple generations of satellites formed, with the satellites we see today being the last to form. The satellites probably formed from planetesimals originating in the solar nebula that were slowed and captured when they passed through the relatively dense gas in the circumplanetary disk. Orbital resonances involving two or more satellites are common. For example, the inner three Galilean satellites— Io, Europa, and Ganymede—have orbital periods in the ratio 1:2:4. This contrasts with the absence of resonances between the planets except for Neptune and Pluto. The ubiquity of satellite resonances suggests many of the satellites migrated considerable distances during or after their formation, becoming captured in a resonance en route. Some resonances may have arisen as the growing satellites migrated inward through their planet’s accretion disk. Others could have arisen later as tidal interactions between a planet and its satellite caused the satellites to move outward at different rates. The Neptunian satellite system is different from those of the other giant planets, having relatively few moons with most mass contained in a single large satellite Triton, which is larger than Pluto. Triton is unusual in that its orbit is retrograde, unlike all the other large satellites in the solar system. This suggests it was captured rather than forming in situ. Several capture mechanisms have been proposed, but most are low-probability events, which makes them unlikely to explain the origin of Triton. A more plausible idea is that Triton was once part of a binary planet like the Pluto–Charon system, orbiting around the Sun. During a close encounter with Neptune, the binary components were parted. Triton’s companion remained in orbit about the Sun, taking with it enough kinetic energy to leave Triton in a bound orbit about Neptune. Triton’s orbit would have been highly eccentric initially, but tidal interactions with Neptune caused its orbit to shrink and become more circular over time. As Triton’s orbit shrank, it would have disturbed the orbits of smaller satellites orbiting Neptune, leading to their destruction by mutual collisions. This is presumably the reason for the paucity of regular satellites orbiting Neptune today. At the time of writing, about 200 planets are known orbiting stars other than the Sun. These are referred to as extrasolar planets or exoplanets. Most of these objects have been found using the Doppler radial velocity technique. This makes use of the fact that the gravitational pull of a planet causes its star to move in an ellipse with the same period as the orbital period of the planet. As the star moves toward and away from the observer, lines in its spectra are alternately blue- and red-shifted by the Doppler effect, in dicating the planet’s presence. Current levels of precision allow the detection of gas giant planets and also ice giants in some cases, but not Earth-mass planets. The planet’s orbital period P can be readily identified from the radial velocity variation. Unfortunately, the Doppler method determines only one component of the star’s velocity, so the orientation of the orbital plane is not known in general. This means one can obtain only a lower limit on the planet’s mass. For randomly oriented orbits however, the true mass of the planet is most likely to lie within 30% of its minimum value. Some extrasolar planets have been detected when they transit across the face of their star, typically causing the star to dim by 1–2% for a few hours. Only a small fraction of extrasolar planets generate a transit since their orbital plane must be almost edge on as seen from the Earth. When a planet is observed using both the Doppler and transit methods, its true mass can be obtained since the orientation of the orbital plane is known. If the stellar radius is also known, the degree of dimming yields the planet’s radius and hence its density. The densities of extrasolar planets observed this way are generally comparable to that of Jupiter and substantially lower than that of Earth. This suggests these planets are composed mainly of gas rather than rock or ice. In one case, hydrogen has been detected escaping from an extrasolar planet. A few objects have been found whose minimum masses are below 15 Earth masses, and it is plausible that these are more akin to ice giants or even terrestrial planets than gas giants. Stars with known extrasolar planets tend to have high metallicities; that is, they are enriched in elements heavier than helium compared to most stars in the Sun’s neighbor hood (Fig. 21). (The Sun also has a high metallicity.) The meaning of this correlation is hotly debated, but it is consistent with the formation of giant planets via core accretion (see Section 8). When a star has a high metallicity, its disk will contain large amounts of the elements needed to form a solid core, promoting rapid growth and increasing the likelihood that a gas giant can form before the gas disk disperses. Both the Doppler velocity and transit techniques are biased toward finding massive planets since these generate a stronger signal. Both are also biased toward detecting planets lying close to their star. In the case of transits, the probability of suitable orbital alignment declines with increasing orbital distance, while for the Doppler velocity method, one generally needs to observe a planet for at least a full orbital period to obtain a firm detection. Despite these biases, it is clear that at least 10% of Sun-like stars have planets, and this fraction may be much higher. The fraction of planets with a given mass increases as the planetary mass grows smaller, despite the strong observational bias working in the opposite direction. Roughly 10% of known extrasolar planets have orbital periods of only a few days, which implies their orbits are several times smaller than Mercury’s orbit about the Sun. These planets are often referred to as hot Jupiters due to their likely high temperatures. Theoretical models of planet formation suggest it is unlikely that planets will form this close to a star. Instead, it is thought that these planets formed at larger distances and moved inward due to type-I and/or type-II migration. Alternatively, they may have been scattered onto highly eccentric orbits following close encounters with other planets in the same system. In this case, subsequent tidal interactions with the star will circularize a planet’s orbit and cause the orbit to shrink. Roughly 20 stars are known to have two or more planets. In a sizable fraction of these cases, the planets are involved in orbital resonances where either the ratio of the orbital periods or precession periods of two planets is close to the ratio of two integers, such as 2:1. This state of affairs has a low probability of occurring by chance, which suggests these planets have been captured into a resonance when the orbits of one or both planets migrated inwards.